Flat-rate fees - where a fixed price is charged typically per-listing or per-lead generated. Subscription - where participants on one or both sides of the market pay a regular fee for access to the marketplace. Commission - where a percentage cut of transaction value is taken. Of these three models the commission approach has largely become the standard with flat-rate and subscription models being relegated to marketplaces where the actual transaction happens off-platform (housing, cars, recruitment, etc.) or where transactions aren't priced (data sharing, dating, etc.). 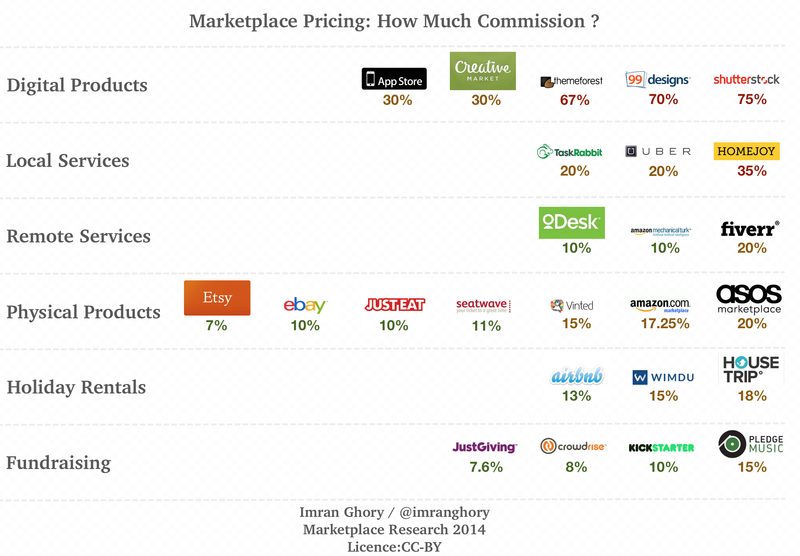 Looking at the data this way it's hard to ignore how high-commission digital product marketplaces are - the low-end of the category being equivalent to the high-end in every other category. It's not clear if it's a case of profit taking or if the digital marketplaces face unique costs (vetting product quality, marketing, etc.) but given that newer marketplaces such as Creative Market are operating at a much lower (although still high) commission the high-end digital marketplaces look distinctly vulnerable to disruption. There's also a noticeable gap between the marketplaces for remote and local services with the later commanding a notable premium. While the obvious explanation would be local marketplaces requiring greater local presence and deeper supply side vetting, the holiday rental market faces similar challenges without the same level of markup. It'll be interesting to see if the rates get driven down as competition grows in the local services space. One factor not taken into account here is transaction value and volume; in theory markets in which those are larger should result in higher revenue from smaller commission. However even once segmented by category it's not obvious that there is a correlation between those factors and commission levels. One reason may be that marketplace startups tend to either be "low-value high-volume" or "high-value low-volume" with the two factors essentially cancelling each other out (presumably "low-value low-volume" markets are hard to build significant companies in and "high-value high-volume" markets extremely rare). If you have any comments or are working on a marketplace startup I'd love to hear from you. I can be reached via email <imranghory@gmail.com> or twitter at @imranghory. Partner at Blossom Capital; previously at Index Ventures. Background in Fintech and Startups. Now figuring out what to do next.